Wow! That’s impressive,” I said to my wife. We were at the annual fair in Del Mar, California watching a stage hypnotist. He had eighteen volunteers on stage and was making them do things they would not normally want to, nor could do. One of the volunteers was a young man named Bill. The hypnotist suggested that Bill had just returned from a trip to the planet Xenon. Would he tell the audience about his trip? Without hesitation, Bill started to describe his trip and the Xenonians that he met. He told the story as if he had actually been there. The hypnotist had to stop him or he would have gone on all night. Most of us would find it hard to stand in front of 500 people and make up a story about something we knew nothing about. And, moreover, tell this made-up story as if we experienced it, when we knew it was fantasy. I don’t know Bill, but I would bet my house he could not have made up that story spontaneously and told it so vividly and fluidly if he was not hypnotized. When you sit down at your desk or kitchen table to write, do you start writing immediately? Do you create a story or a scene and write it down in detail without hesitating and agonizing? If you do, then you never have “writer’s block.” Lucky you! But if you have occasions when nothing comes to mind and you can’t get started on the story, then you’ve had writer’s block. Is there much difference between Bill’s experience and when you have writer’s block? The difference is huge. When you have writer’s block, you are limiting yourself by only using your conscious mind, and at that, only a tiny portion of it. Bill, on the other hand, used over 90 percent of his mind. He used his subconscious mind—his fertile, imaginative, creative mind. Your conscious mind is critical, judgmental, and carping. That’s the part of you that interrupts your writing and says, “This stinks,” “I can’t write about that,” “I just can’t think of a thing to write today,” on and on. Your mind also inhibits you with false beliefs. In your early, formative years, you were told thousands of times things like, “No, you can’t do that,” “No, don’t do that,” “No, that’s too hard,” “No, no ,no, don’t you ever learn?” These responses are suggestions (just as if they came from a hypnotist) that go into your subconscious mind. Thus, you are hypnotized to believe you are limited and, worse, you are unconscious of these negative beliefs. The epitome of a false belief is the story of Roger Banister. Runners, coaches, and trainers were hypnotized to believe running a mile under 4 minutes was not humanly possible. Race times asymptotically approached 4 minutes but no runner could break through this mental barrier. Not until Roger, who “knew” he could do it, did it. Within months other runners broke the barrier. Those runners could not break 4 minutes until someone showed them that their belief in limitation was false. When your writing is blocked, do you “try” harder? Do you find that the harder you try, the more blocked you become? Trying harder is fighting against an absolute law of the mind. You can’t win. So, how do you beat writer’s block? Instead of writing with your conscious mind, open up and tap into your subconscious mind. Your subconscious mind is the part of you that is imaginative and creative. How do you tap into your subconscious mind? This may sound too easy, but it works. Just relax and talk to yourself. Affirm that you have the ability to write and that the story or poem is already written. Too simple? That’s Mother Nature’s way: the best way, is almost always the simplest way. When relaxed, you slip into an altered state of mind. That’s the key to being creative—going into the alpha or, much better, the theta state. Dali, the abstract painter of weird landscapes, used to go into theta before starting a new canvas. That is how he got his visions of melting time and distorted figures, concepts foreign to the logical, linear-thinking conscious mind. It is simple to learn to go into these states. And it is invaluable if you want to be creative and write from the heart. 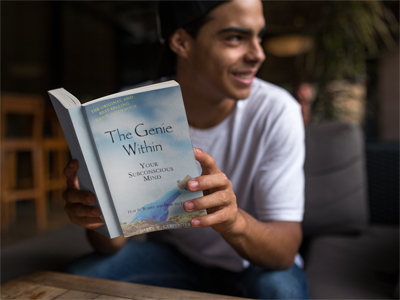 If you want more detail and more powerful methods of using your subconscious mind, get a copy of a book that many readers say is the best book written on the subject (Some of these reviews are posted on www.Amazon.com, and www.thegeniewithin.net) The book is, The Genie Within: Your Subconscious Mind—How It Works and How to Use It, by Harry W Carpenter. Oh! That’s me. How shameless to brag about my book. I couldn’t help it. It came from my subconscious.